Birding Is Fun! : ABA Bird of the Year! 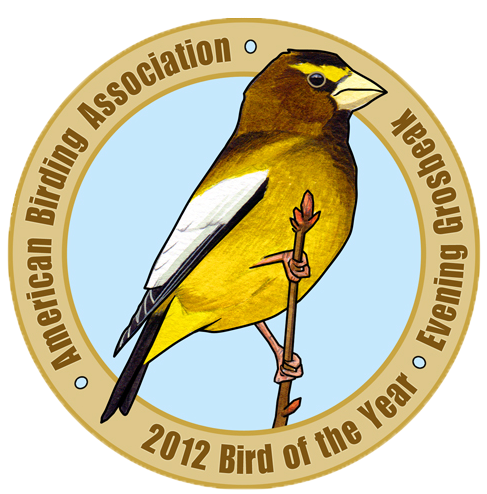 This morning, Jeff Gordon, president of the American Birding Association, announced the 2012 Bird of the Year...the Evening Grosbeak. Check out his hilarious video unveiling as well as his post talking about the ABA Bird of the Year program! Since last fall, I've had the honor of serving as the ABA Bird of the Year Coordinator. It has been a blast working with the awesome ABA staff to wrap-up the reign of the American Kestrel in 2011 and then to have participated in the selection of the new bird of the year. 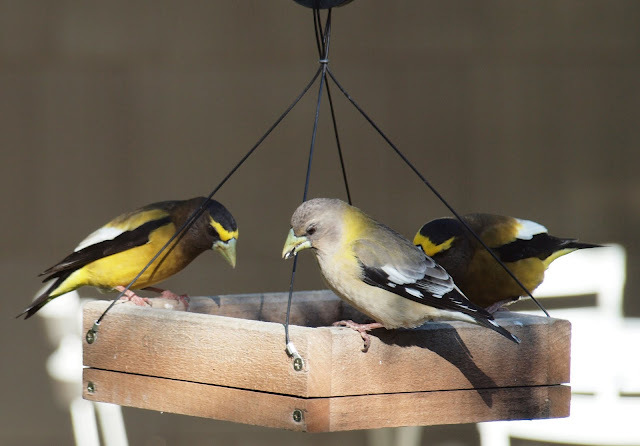 Why the Evening Grosbeak? I'm glad you asked! Check out the ABA Bird of the Year website we put together for the reasons we chose this super cool bird. We've put together a great line-up of activities and events tied to the Evening Grosbeak for the year. There will be radio spots, podcasts, blog posts, articles in magazines, contests and even ABA Bird of the Year merchandise! 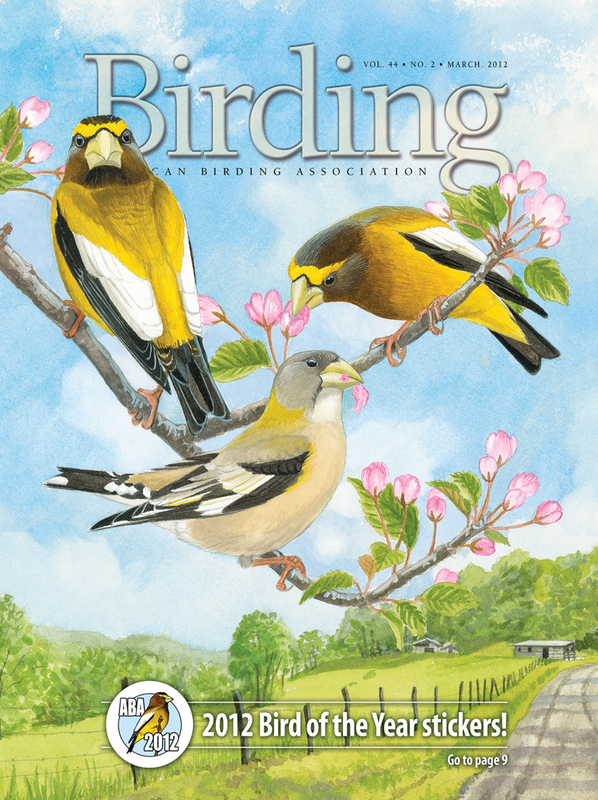 ABA members should be getting their new stickers any day now in their March issue of Birding. I've got my stickers and have already put them on my binoculars. The artwork on the sticker and on the cover of Birding magazine is all from the fabulous and amazingly talented Julie Zickefoose. The sticker layout was designed by ABA graphic artist Ed Rother. I hope you'll have us much fun with the Bird of the Year program as I do this year. Please consider showing your support of birding by joining the American Birding Association. You may be wondering about how the ABA goes about selecting the Bird of the Year. Well, after spending tens of thousands of dollars on market research using focus groups around North America, we determined which bird species most appeal to...just kidding! In reality, at Jeff Gordon's request, I simply prepared a list of a dozen or so birds that I felt would be great totems for the ABA. I shared my list with the ABA staff including my thoughts on the pros and cons of each species. I felt that the bird should be "possible" to see in most of the ABA area, that it should be striking and interesting in appearance so that it might spark the interest of non-birders, and that it have some aspect of conservation connected with the species. Everyone on the staff had a chance to weigh in by way of an email discussion and the Evening Grosbeak just seemed to quickly rise to the top of the list by general consensus. Looking back, I'm awed by how rapidly we came to this sense of unity surrounding a bird with a yellow unibrow. We also want to try and avoid predictive patterns in which species gets selected from year to year. We want the mystery of which species is going to selected to be tantalizing. If you are on pins and needles anticipating the Bird of the Year announcement, then I'm doing my job. It's all about fun and celebrating birding! Great choice. Now I've got to see one! Fantastic! I have yet to ever see one of these striking birds in person. Hopefully someday soon.